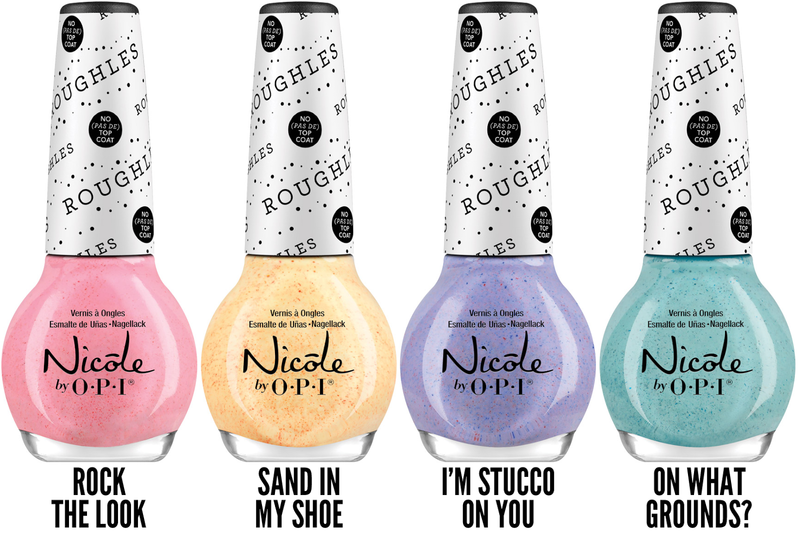 This March, Nicole by OPI launches Roughles ("ruffles") -- 4 new textured nail lacquers featuring speckled, pastel shades of purple, pink, turquoise and yellow. When the lacquer dries, Roughles lacquers reveal a unique pebbled finish. Roughles should be applied without a top coat to achieve a matte effect. "Chic pastels were a major trend throughout the runway collections at spring/summer 2014 shows and textured, matte nails are going to be one of the hottest looks this spring," explains Suzi Weiss-Fischmann, Nicole by OPI Executive VP & Artistic Director. "Wearing these feminine shades on fingers and toes is a refreshing take on this trend. Pair these lacquers with candy colored fabrics and flirty floral prints to really make a statement!" I'm Stucco on You - I terra-"cotta" have this textured purple on my nails! Rock the Look - The edgy side of girlie...a textured pink all your own. On What Grounds? - Stop in the name of this textured turquoise beauty! Sand in My Shoe - I "beacha" just love this grainy golden yellow on me.